DURING SPRING BREAK IN MARCH AND IN THE AURORA OF THE DAY (en la madrugada), the soon to be traveling residents from Asherton-Ashinto-Cheto (the three names given to this little and adored town and which seldom is referred by its real name of Asherton, Tejas) warmed up their engines, compared travel plans, and with the sign of the “CROSS” (en el nombre del padre del hijo y del espiritu santo; amén) for good luck, the caravan began to pull out of Asherton on route to Oregon. Everyone who shared their story remembers well the first few hours of travel; it was a special ritual that united everyone in this venture. A venture of 3-5 days will be the first for most of the Ashertonians in the early 1950’s. My first venture to Oregon via car was in 1954. A two-tone 1948 Chevy four doors with an adaption for travel that only my dad could create. The boxes and basics that we had were used to convert the back side of the car to a bed and multi-purpose area. The rear deck of the car was also used as a small bed almost like a crib for my sister and me to gaze at the stars at night as we traveled. “El lonche”… my mom had prepared the day before was good for 2 or more days. No restaurants or stopping at fast food places as cash was low and we had to think of the distance to our destination. The lunch was simple and as I recall the food was tasty. Our traveling menu consisted of things like: soft tacos de tortilla de harina with a mix of refried beans, chicharrones, egg or other combinations that could last without getting spoiled and the salsa that made everything taste good. A piece of Wonder bread with butter and jam or cookies was our dessert. I am getting a “Pavlovian” reaction and my mouth is beginning to water. And of course I am not leaving out my dad’s favorite-hard boiled eggs which were put in a greenish-blue Kerr canning jar with a bit of salt water and a container of dill pickles mixed with peppers. These days were not all bad! From a child’s view point traveling was and adventure and the worries I left up to my mom and dad. A canvass water bag placed in the front of the car held by the bumper was part of our traveling gear. The water was used to drink, share with the radiator; something that was predictable on any trip or even to help another driver member of the caravan or traveler in need. The major highways were 99-E and 99-W and a few other highways that kept us going north. No freeways made traveling a bit more dangerous and noisy. Heavy travel in narrow highways meant a lot of defensive driving. Both hands on the wheel were a must as the air turbulence created by large vehicles made our small car sway and vibrate as each vehicle passed each other going on opposite directions. My dad liked traveling at night. Before night fall, he would ask me to take a good nap so I could co-pilot with him during the evening hours. My evening responsibility was to keep him company and awake by talking to him and making sure that the radio was turned on to a station with little or no static and preferably in Spanish “Los laboratorios Mayo” was always a good stand-by station that specialized on remedies and health advice. On occasion, I would fall asleep and when I woke up I pretended that I was still fulfilling my responsibility as a co-pilot. In a playful manner my dad would began to test my ability to stay awake—“Did you see that truck that was stuck on the highway?”.. He would ask; any reply I would give him would be wrong… so, I would tell him that I missed it J. And soon, he would give in to the temptation of getting some shut-eye himself and take a walk to rest his legs. Being the only driver in a 2K mile journey was not easy. My mother did not know how to drive; in fact, in those days very few women were ever seen behind the wheel. A nap that would last no later than the break of dawn was good enough for my dad to get behind the wheel again. After a few hours of rest he would get out of the car, respond to bodily needs, clean the windshield, take a few ounces of water from the water bag to wash his face, clear his passages and return to warm up the car and in a few seconds join the highway once more as he once again made the sign of the “CROSS”..FAITH! My dad was a survivor and a person who respected everyone and everything, but feared nothing. A risk taker who with a few English words had lived the life of a hobo prior to marrying my mom. He had been to more states and cities than most people with means to travel. His natural ability to face any situation or challenge made me relax and enjoy his company without any worries. However, there were times that I was a bit embarrassed or ashamed due to his tunnel vision approach to life and not following social edicate. “A man possessed” is a good way of describing him. Later in life, I would mimic some of his traits. I made this observation later in my maturity and after my mid-life crisis. His total persona helped me see the world differently and the 2K drive to Oregon in retrospect was made easy due to his survival qualities and human natural tools that he had developed since he was a child. He was the first Tejano child born to Francisco and Virginia Salinas and the youngest of six siblings. His life experiences were evident every place we went. Like any other child I would trust my parents and I felt SAFE and able to do anything. We left Asherton in the early morning (madrugada) and we arrived in Chandler, Arizona. This had been part of my dad’s route to Washington and Oregon. We arrived before day break to a large corral or compound where there were only trailer homes, campers and where most of the occupants were Negroes (name used in those days to describe a person of color). All of the sudden the trust and confidence I had developed with my dad became a bit weak. This was my first exposure to people of color and I did not know how to react when the light of the day broke and I peaked outside the car window and saw only black people. My dad was accustomed different environments and ethnic groups or even languages; his life as a hobo had taught him about the world. Soon, I learned that we had stopped there momentarily as he was just trying to keep in touch with former bosses and friends and find work so we could stop on the way back from Oregon. I later learned that picking cotton was one of his favorite jobs; he was one of the BEST! Everyone who knew him described him as the HARDEST AND MOST CONSISTENT WORKER AND A PROUD MAN! Later in the day we continued on our way to Oregon. It was the first time for me, but not for my mom and dad. I remember arriving to St. Paul and more specifically a camp that was located next to a hop-machine and barns and kiln where the famous fruit of the hops was prepared for hauling to the various hop processing plants. I was awakened by the sound of voices and a language that were neither English nor Spanish. My dad took us to a camp that was occupied by Filipinos. Again, my dad mingled with ease and even spoke as if he was part of the family. School was still in session and my dad took me to Saint Paul Catholic School to register. A new experience for this kid from Guadalajara, Jalisco the 2nd largest city in Mexico now camping out in a place that was 3K miles from my birth place. I had been in Catholic Schools in Mexico and thus my mom asked my dad to register me at St.Paul Parochial School. The teachers were nuns and we celebrated mass daily before going to our first class. Like an obedient sheep, I just followed the crowd or the nun who guided traffic as we filed from church to the school b. The eyes of this 9 year old kid saw the school as a large hotel and with fear of getting lost. What is the new kid in town to do? 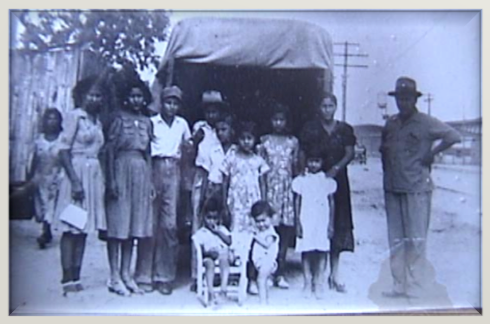 No English, new to the culture, no friends or within a social setting to make any friends besides a school with 99.9 white Anglo student body, new to the Tejanada or Spanish surnamed people who had also arrived from Asherton but knew some English….I began to observe and retain most of my daily experiences. It was a matter of survival. Thanks to my schooling in Mexico, learning came easy to me. A five year old Miguel with his mom and abuelita Maria-“Kika.” Prior to traveling to Oregon. The DNA is easy to see. My mother a product of an Indian mother and a mestiso father more French than Indio. In the future there will be a story about Potrerillos, Jalisco Mexico a village where many of the Amezcuas will originate. TO THE VISITOR A reminder that this website contains biographical, as well as, autobiographical material. So, if you are scratching your head…don’t worry about it. It is my privilege to bring a personal account about our journey to Oregon more than a ½ century ago. In 2002 our FAMILY sponsored the only REUNION ever for the Tejanada in Marion County the EPIC Center for migration. 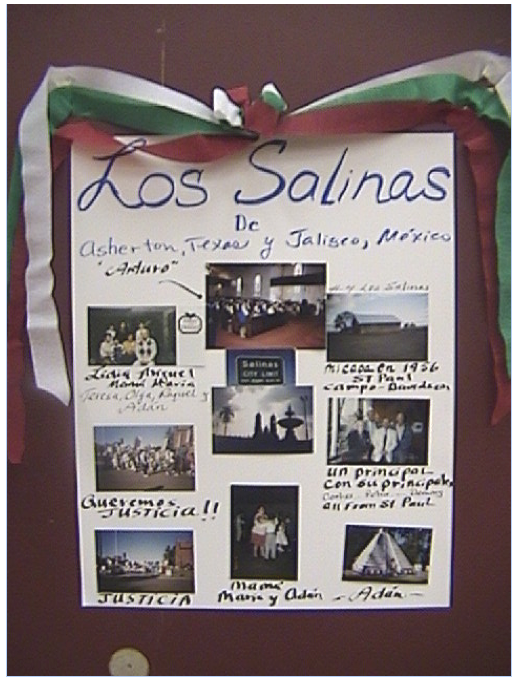 Los Salinas on Arturo my father’s side of the family were the FIRST MIGRANTS in the St. Paul, Oregon area. Residents of Ontario and other Eastern Oregon and Southwestern Idaho communities gathered in front of the few new local television sets on Sunday, July 15, 1953 to watch the first signals arriving from the first station in the area. It was Boise’s KIDO TV, which went on the air at 2 p.m. that day. The first national show to come across the screen was the Dennis Day Show. In Ontario, The Argus-Observer photographed the Hathaway family, including daughter Sue, 14, and son Chuck, 13, gathered around a set in their living room. As my mom and dad and sister Virginia made their home in and around the Bunning Farm in St. Paul, Oregon, our county located by the Idaho State Line was celebrating a thing called the TV. Only a handful of sets were available and a few shows for family viewing. FAMILY VIEWING was exactly that a whole family viewing the same show. Perhaps a lesson from the past should be celebrated and honored…as families become a small island, but with many options of viewing the world. One could add that the family who watched TV together..stayed together…and NOW……? Until the next short story!